The City, through its housing agency HPD (Department of Housing Preservation and Development), controls to a certain degree subsidized housing, housing programs and buildings that have agreements with the City such as the Housing Development Fund Corporation (HDFC) cooperatives. Lately the value of real estate in areas where most of these HDFC buildings are located has increased hugely. While the City has full control over social housing it does not have much control over HDFC Cooperatives, a model of housing designed to be self-sustaining and free from control or supervision by the City once it has been re-constituted from a rent-stabilized building into a cooperative. An HDFC Coop is a coop created by a disposition program that began in the 1980s, a transaction between the City and its citizens. 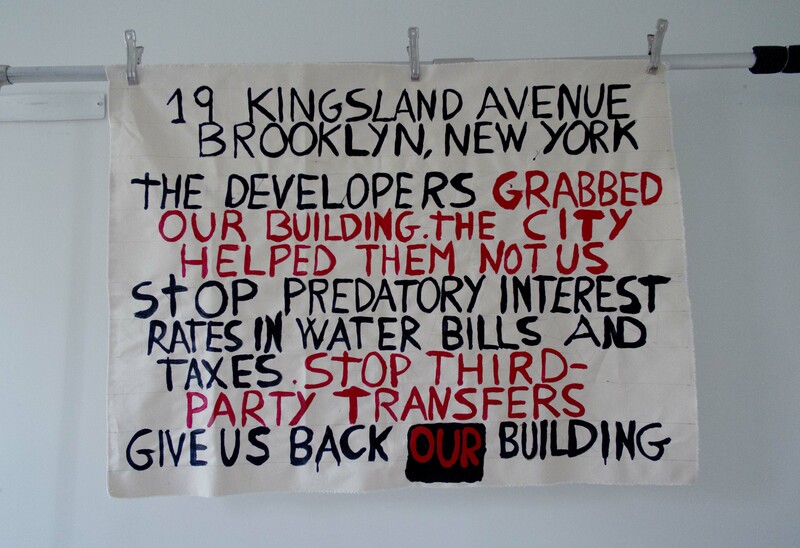 It saw the transformation of rent-stabilized buildings that, having been neglected by landlords and rejected by banks, were sold to their tenants, thus becoming privately-owned cooperatives. The new owners/shareholders slowly restored their buildings to health and paid fees and taxes to the City. The Office of the Mayor and HPD (Housing Preservation and Development – NYC.gov) have sent a proposed ACT Bill to Albany, its purpose to amend the Private Housing Finance Law, in relation to Assets and supervision of HDFC: Housing Development Funds Corporation (‘17HPD#1). At the same time they have been trying to 1) impose a Regulatory Agreement on HDFC coops and 2) pass a bill that revokes a tax exemption unless owners/shareholders sign the agreement. This Regulatory Agreement by the City/HPD for the Housing Development Fund Corporation (HDFC) contains different anomalies including a threat to take away a tax exemption that doesn’t expire until 2029, taking ownership away from shareholders by introducing a monitor who must approve sales, by changing income limits, by changing leasing conditions that are already determined by a coop’s incorporation by-laws, by introducing flat flip taxes that are currently decided by the Board of Directors, and by introducing two types of shares into a building. Now the current proposed Albany ACT legislation goes further by devaluing the private property that shareholders lawfully purchased, own, and maintain. With the current legislation HPD will be able to remove a board of directors, set different income-limit requirements and flip taxes, approve the sales of shares, change the definition of low-income for new residents, and lower the sales price of every apartment. Those who bought under long-standing rules, suddenly see their equity evaporate. Without warning or democratic process, the City wishes to change the model of HDFC housing. If you look at the population in HDFCs you will see that a huge percentage are entrepreneurs and professionals who invested in and renovated their buildings and apartments. HDFC buildings were off-loaded by the City because they were crumbling and the City didn’t want to deal with them. They were not created as affordable housing because all New York was affordable, it just wasn’t safe. HDFCs shareholders made communities safer and increased property values. Now that their properties are very valuable, the city wants then back! The use of the term “low income” in the ACT Bill uses the common understanding of low income to mean “people who make little money,” and this is different from the legal definition of “low income,” which in current law means “those who cannot afford a house at market rate.” This amendment attempts to legislate a change the HDFC definition of low income: from a legal meaning to the common meaning. But the HDFC model was not created for those who make little money; being a corporation, the shareholders have to be able to pay bills, to invest in their property, to cover repairs, and to keep their buildings up to ever-changing NYC codes. Both this proposed ACT Bill and the proposed Regulatory Agreement will not expand anything. They are not positive but negative. They are about taking away rights, not about giving assistance. They impose and coerce. The Summary reads,“This new section will impose restrictions . . .” Furthermore, the ACT Bill and the proposed Regulatory Agreement were done without consulting those who would suffer under them: HDFC shareholders. The language and the content of this proposal is punitive (fees and fines are introduced to the HDFCs shareholders, board of directors removed without clear criteria). Instead of talking to HDFC shareholders so that they understand how these buildings run, what their challenges are, and how the City and HDFC shareholders can move forward with a win-win vision, the Mayor and HPD are strategizing without transparency, attempting to undercut HDFC shareholders with top-down legislation. The role of the government in a democracy is to work in favor of the individual, to strengthen communities, and not to impose, force and dictate. The questions are: Why this? And why now? Mayor de Blasio built his campaign on a number of promises and one of them was a vow to create more affordable housing either by building or preserving housing. The Mayor has talked about “preserving affordability.” The Mayor and HPD have focused on HDFC apartments, approximately 30,000 in NYC. The Mayor is trying to shape HDFCs into affordable housing and win points for his reelection. With rental properties, rents can be frozen. A way to hold prices low on privately-owned buildings is to control the price of future sales. HDFCs, although owned by their shareholders, do have agreements with the City regarding income limits on those who buy into an HDFC coop. But there is no limit — and there never was a limit — on the price of a sale. The Mayor’s desire to cap sales prices on any NYC dwellings he can may look good on paper but it is also a violation of the right to private property. HDFCs coops make all decisions on sales and flip taxes, per their by-laws. The Mayor/HPD has determined that they will simply write legislation that undermines or circumvents HDFC by-laws and imposes a low cap on what an HDFC apartment can be sold for. The Mayor/HPD mean to change the model of the HDFC from self-governing private property to government-controlled public housing. By imposing punitive and financially subversive new regulations on HDFC buildings and their owners, the Mayor/HPD will cause buildings to fail, monthly maintenance to skyrocket, and middle-class and lower-middle-class shareholders to sell. The Mayor and HPD are not “preserving” affordability so much as “moving” it. Since HPD will have jurisdiction to adjust the cap of the sale price depending on the apartment there is room for preferential treatment and profiling. Empty of old owners, these buildings can then be handed over to developers or to those who are lucky enough to win the HPD/Bill de Blasio lottery. The “units” will change hands but no new units will be built. This is not the creation of new housing (no new homes for low income are being built here) but merely a numbers game (the old are counted as new.) There is no new generation of goods. As a result, healthy HDFCs and the well-being of their shareholders are destroyed so that the Mayor and HPD can say they succeeded with their numbers. The proposed Regulatory Agreement and the ACT Bill amendment of article XI or Private Housing Law will be instrumental to achieving this goal. “Mayor Bill de Blasio is rolling out a plan two years in the making to impose strict new regulations on some 1,200 privately owned co-ops, a move critics say is a brazen effort to give a bogus boost to his affordable-housing numbers. 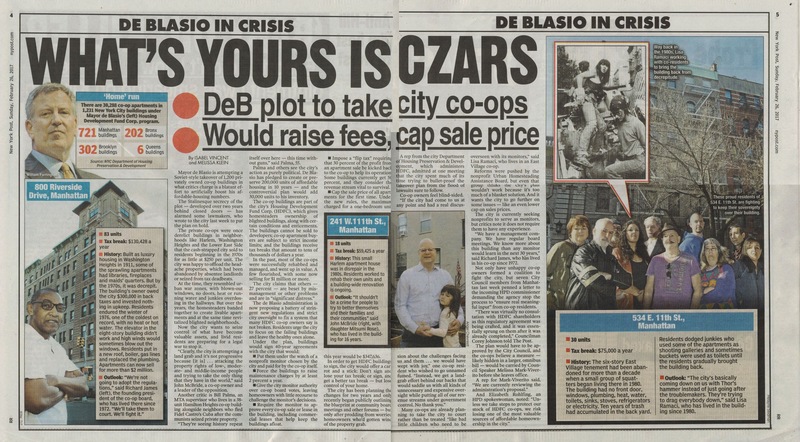 The co-ops are part of the city’s Housing Development Fund Corporation, which the city established in the 1980s to sell off derelict buildings in places like Harlem, Washington Heights and the Lower East Side for as little as $250 per unit, the New York Post reported. Previously to reach ownership the buildings enter into the TIL program. The duration of the this program varies depending of building and it might goes form 2 to five years but as its name indicated it is a interim or temporary program for tenants became owner and transfers of shares. Lately tenants are awaiting in this program for years, apartments being vacant for years and looks like somebody is getting a benefit from it. A pattern: tenants are asked to leave temporarily while renovations take place in the building. HPD gives a low interest loan and chooses the contractors who will do the renovations in the HDFC coops. The quality of the work done is so badly that it needs to be redone, costing much more money and time than it should have. In an increasing number of cases the buildings remain “in renovation” for several years; tenants don’t have a place to live and unregistered tenant are allowed into them. In some cases the apartments are not only renovated they are also subdivided. Finally, the inflated renovation costs, due to lack of control and accountability, end up increasing the rent to more than any of the original tenants can afford. In summation: TIL has become a tool for land/home appropriation. “The city Department of Investigation is probing a special housing program that allows tenants to buy their apartments for as little as $250, according to multiple sources. WEST HARLEM — Luisa Rodriguez moved out of her West 150th Street apartment temporarily in 2008 after the city promised to make crucial repairs on the unit and then let her buy it for next to nothing under a city-sponsored program. However, eight years later — at age 75 — she said she has yet to see that plan come to fruition under a rent-to-own program advocates claim has failed to deliver on its mission. 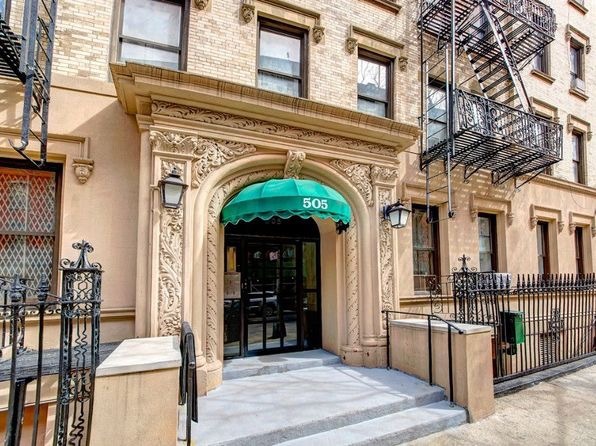 The building at 615 W. 150th St., owned by the Department of Housing Preservation and Development, is currently part of the city’s Tenant Interim Lease (TIL) program, which was meant to be a pathway for renters in city-owned buildings to purchase their units for just $250. But residents under the current program claim HPD didn’t follow through on its promise, failing to do repairs and then sell the units back at a rock-bottom price, which initially attracted many to the program. Now, Rodriguez’s building and all 156 others in the TIL program are set to transition to HPD’s Affordable Neighborhood Cooperative Program (ANCP), a similar rent-to-own option that brings developers in to rehab the properties and convert them to co-ops using city-backed loans, private loans and state grants instead of taxpayer dollars. The other program associated with HDFC coops is the TPT (Third Party Transfer). It is supposed to be an assistance program that helps turn around HDFC coops that are facing financial problems and are unable to pay taxes and utility bills, or cannot afford necessary repairs. In reality this program seems to have morphed into a transfer program. No assistance is offered, either in the form of education or in reasonable payment plans for bills that goes to the city (tax and water). Indeed, quite the opposite is taking place. TPT is allowing increasing numbers of HDFC buildings to fall into foreclosure and it appears that the city has an interest in seeing a building fail. Also remarkable is the large interest that the City charges for unpaid bills and taxes when the interest on this money is below 1%. Bills of a few hundred dollars rapidly become thousands. In this way the City propels HDFCs into default and the ensuing third party transfer. It’s a simple setup. Owners have a debt or municipal liens of over $3000 per apartment; the City has the power to initiate a foreclosure action; and after a court judgment, these properties are adjudicated to pre-selected third party owners (not-for-profit organization that partner with City agencies) The time frame for the transfer is restricted to under a year. The new owners will take shares and ownership over the building and will act as a managing company that then leases apartments to the previous owners, now tenants. Often the city pardons the new owners from any payment on the building in water or taxes. How the third-party owners are selected remains unknown. The process is the opposite of transparent. It is cloudy, murky, and unmonitored. Photo courtesy of the HDFC Coalition. This is not just conspiracy theory; on October 2 2019 I hung the banner I have made at 19 Kingsland Avenue, Brooklyn, New York and sit for the picture with the residents. Six months after this photo was taken (by Michael Palma Mir, from the HDFC Coalition) and after intense efforts in many fronts to fight the abuse, the owners got their building back thanks to Judge Mark Partnow. Among many of the forces against TPT abuse is Palante Harlem lead by Elsia Vasquez and Glory Ann Hussey Kerstein from the HDFC Coalition, and James E Caldwell 77th Precint, Community Council. The number of foreclosures in HDFCs is increasing. Has the TPT have became a “grabbing” program, a legal way for the city to appropriate of private homes? The City, through its housing agency HPD (Department of Housing Preservation and Development), controls housing programs. The Department of Asset management has solo jurisdiction in the choosing of those who are allowed to perform jobs in any buildings that have some level of dependency, by contract, with the City. The amount of money in these services seems small but it is not if you look at the number of buildings that lack, due to HPD’s hidebound staff, knowledgeable and benevolent supervision. This sector includes the work of small construction companies that rehabilitate social housing, and housing with tax exemptions such as HDFC (Housing Development Fund Corporation) cooperatives. A newly proposed regulatory agreement, would oblige HDFC cooperatives to choose managers for their buildings from among the names that appear in a list proposed by HPD. In subsidized housing, if there is a debt of more than $3,000 per dwelling, the building automatically becomes the property of the city. By having both administrative control and intimate access to the finances of a building, HPD-approved managers could manipulate the books, create errors, and forget to log payments so that the total debt of the building exceeds the legal ceiling that has been established. Residents and owners then lose their buildings and their homes. This is called “to grab” — “appropriation of property by dubious methods.” The current proposed agreement also includes a monitor, subcontracted by HPD among not-for-profits. These “monitors,” requiring no license and accountable to no one, will control what happens in every building and report back to HPD, without any cross-checking by any other city agency. Through this new legislation, which it is pushing hard to pass, HPD opens the door for predatory practices on buildings that are located in highly coveted NYC neighborhoods, such as Harlem and Washington Heights. There are precedents of irregularities in the hiring of support services. Wendell Walters from HPD is in jail for taking bribes from construction companies. 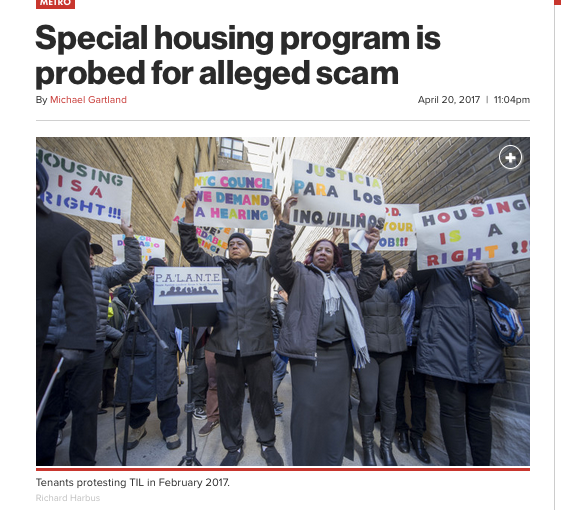 “The official, Wendell B. Walters, the assistant commissioner at the Department of Housing Preservation and Development responsible for new construction, was arrested on charges that he took money from developers involved in building about $22 million in moderately priced housing overseen by the agency in the Bronx, Queens and Brooklyn since 2002. 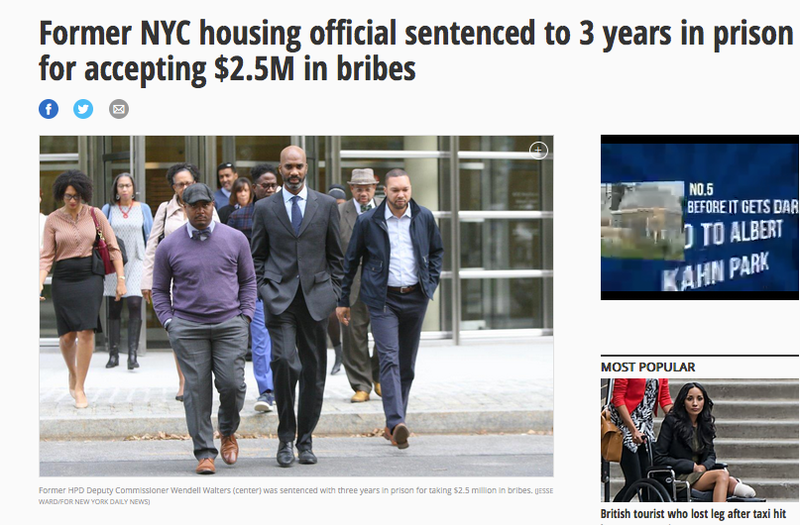 ” Ex-Housing Preservation & Development deputy commissioner Wendell Walters was smacked Wednesday with three years in prison for glomming $2.5 million in bribes – including a developer picking up the tab for his Greek honeymoon and renovations to his brownstone on Harlem’s historic Strivers Row. A former senior official of the New York City agency that helps build housing for people with moderate incomes pleaded guilty on Friday to accepting about $2.5 million in bribes and other benefits since 1998 — more than four times the $600,000 he was at first alleged to have accepted. 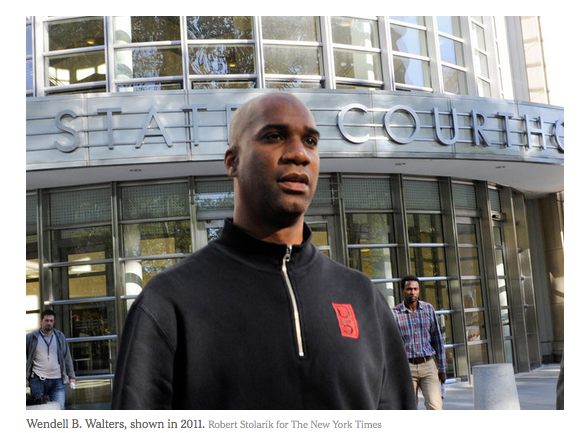 Prosecutors said Mr. Walters, 49, steered contracts to developers in exchange for cash, which he pocketed. Developers and contractors involved in the scheme then passed the cost of the kickbacks and bribes on to the city with inflated invoices, the authorities said. In exchange for Mr. Walters’ plea, nine other counts that he had faced — including extortion, wire fraud and conspiracy to commit wire fraud — were dropped. Q16. Do you have to have monitoring experience to apply? A16. No you do not need monitoring experience to apply. Q7. Is there a maximum number of buildings a Monitor can work with at a certain time? A7. No. A Monitor can work with as many buildings as they are chosen for as long as they have the organizational and financial capacity. 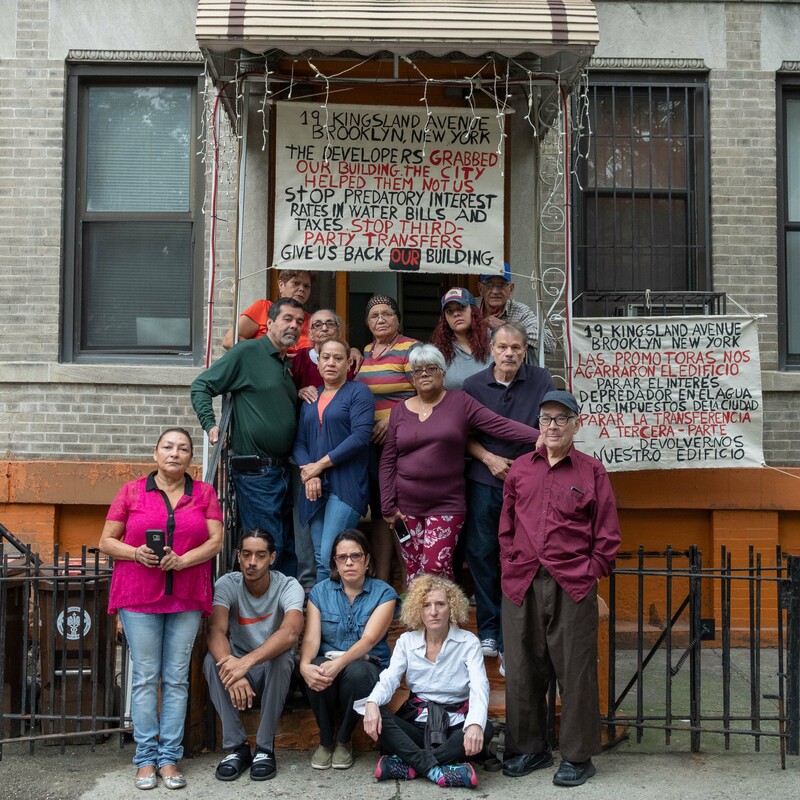 The Department of Housing Preservation and Development (“HPD”) of the City of New York (“City”) is issuing a Request for Qualifications (“RFQ”) for qualified not-for-profit and for-profit organizations to participate in the monitoring of Housing Development Fund Corporation ( HDFC) cooperatives created through HPD’s Affordable Neighborhood Cooperative Program, Third Party Transfer – Tenant Petition program, and HDFC cooperatives that already exist under the review of HPD’s Division of Asset Management and are entering into new Regulatory Agreements with HPD. The deadline to respond to the RFQ has been extended to February 17, 2017 at 4 PM. HPD invites qualified individuals and organizations to submit descriptions of their qualifications to monitor affordable cooperatives created through these programs for regulatory compliance. HPD subcontracts not-for-profits to do part of the work that the city agency is not able to do itself. Organizations such as UHAB provided assistance in the formation of the HDFC cooperatives. Now UHAB has lost its contract with the City and is looking for work. A policy that forces mandatory monitors on buildings will instantly be a source of income for UHAB or any other not-for-profit performing the job. The question is who monitors the monitor? And who monitors the building managers and the construction companies working in collaboration with HPD. Monitors, managers, bids, pools, UHAB wanting its power back, HPD subcontracting its own responsibilities willy-nilly and with no concern for tenant or shareholder rights. 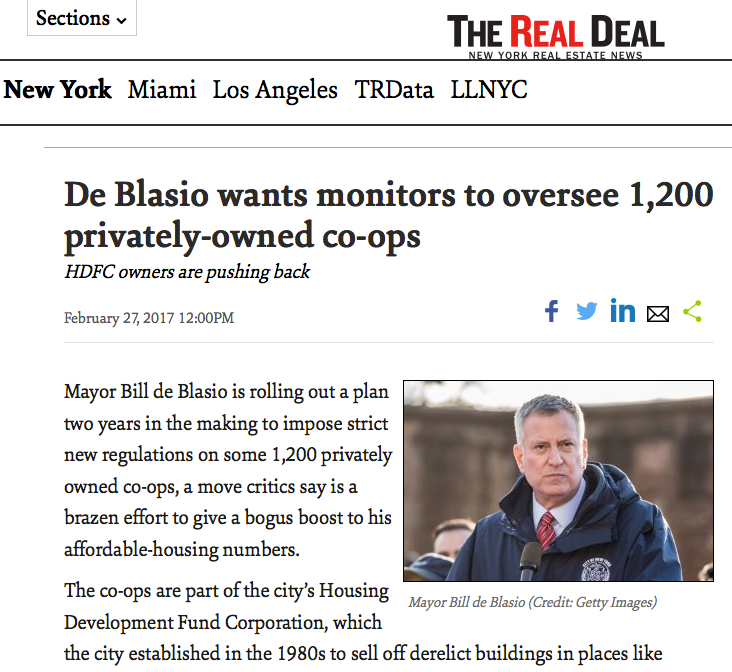 It’s a lot of “unmonitored” moving parts all aimed at taking autonomy and equity — illegally — away from 1,200 NYC coops. I found a letter from April 30, 20141 from Erica F. Buckley , chair COMMITTEE ON HOUSING AND URBAN DEVELOPMENT. It was addressed to the Mayor and its agenda pushed an alternate understanding of low income, which is legally defined as those who cannot buy at market level, NOT as those who have no money). In a meeting I heard a story of a building facing financial problems after a constructor chosen by HPD did a horrible job, which needed to be redone by another construction company; that building while facing foreclosure was consulting with Erica F. Buckley, who was getting a fee of $700 per hour. Erica F. Buckley used to work at UHAB, where she pushed for these regulatory agreements and mandatory monitors. She is not in public service anymore. Associate Commissioner Anne–Marie Hendrickson, who reviewed resumes, … Ex. R.) Hendrickson ultimately selected Wendell Walters to fill the vacancy. The scheme is as follow: social housing (that the city owns) that is in bad shape and has a history of code violations is sold to developers who renovate and hopefully improve the living conditions of tenants. These buildings are located in areas that are becoming desirable. When the area is desirable, if the buildings are not owned by the City the rents will go up. 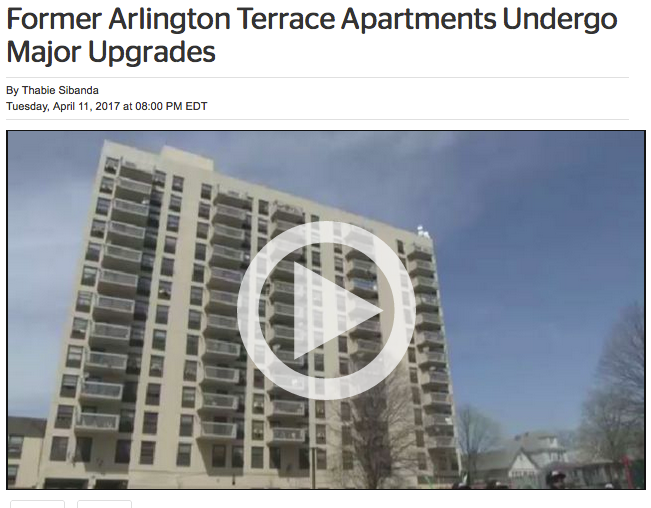 “An old apartment building that was troubled with thousands of violations has undergone a major renovation. NY1’s Thabie Sibanda got a firsthand look at the newly updated North Shore Plaza…… BFC Partners bought and took it over in 2014. They are the same company behind the Empire Outlets in St. George. Narducci says ever since they took over things have changed for the better. “I’m usually the one that complains but honestly this is the best I’ve seen in about 30 years. This is amazing,” said Narducci. Development to extensively rehabilitate this complex: a complex that was once plagued with over 3,000 violations. Why is a private real state firm preserving this housing? Why developers bought it and why BFC? 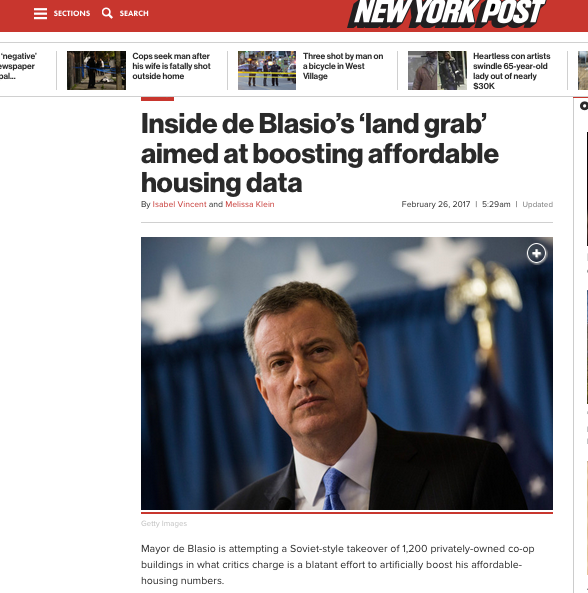 The de Blasio administration on Wednesday leaked advance information about the next phase of its plans to continue to privatise city real property at the New York City Housing Authority, or NYCHA. BFC Partners was selected to develop 145 new units in what is now green space at the Ingersoll Houses in Fort Greene, Brooklyn ; Dunn Development was selected to develop 188 new units at what is now a parking lot at the Van Dyke Houses in Brownsville, Brooklyn ; and West Side Federation for Senior and Supportive Housing was selected to develop 156 new units in what is now a parking lot at the Mill Brook Houses in Mott Haven, The Bronx. 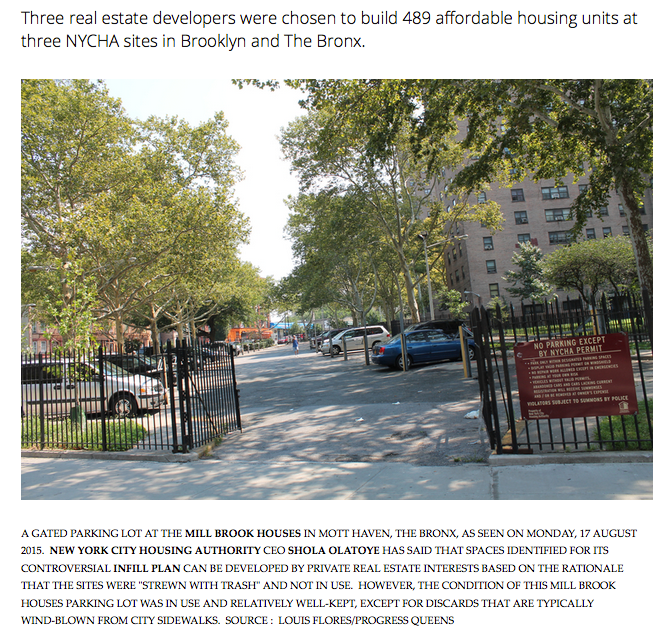 Selection of the developers to construct new buildings of affordable apartments were made by officials at NYCHA, the New York City Department of Housing and Preservation Development, and the New York City Housing Development Corporation, according to one-sheets distributed by NYCHA to the press. One of the ways The Mayor has tried to create new housing has been to make deals with developers, who are required to set a percentage of affordable apartments in exchange for a tax exemption. This scheme has many problems: first, the number of affordable apartments within each new luxury condo is very small, second, the affordability is not permanent, and third the context of luxury and low-income is problematic. Also many of the new developments are built on lots that were rent-stabilized apartments, and the new offer of social housing has come at the cost of losing permanent rent-stablized apartments. In the last four years alone Chinatown has lost 15,000 apartments that were, until now, rentals. With the change of legislation, the area was re-zoned to allow new building of up to forty floors instead of five. This multiplies the value of the land and compels landlords to sell their buildings, for great profit, to the developers. Of course, they then have to cast out their tenants, most rent-stabilized. Hundreds of food shops, curios, small print shops or workshops are being evicted from the premises they occupied, and are now being converted into boutiques and art galleries. 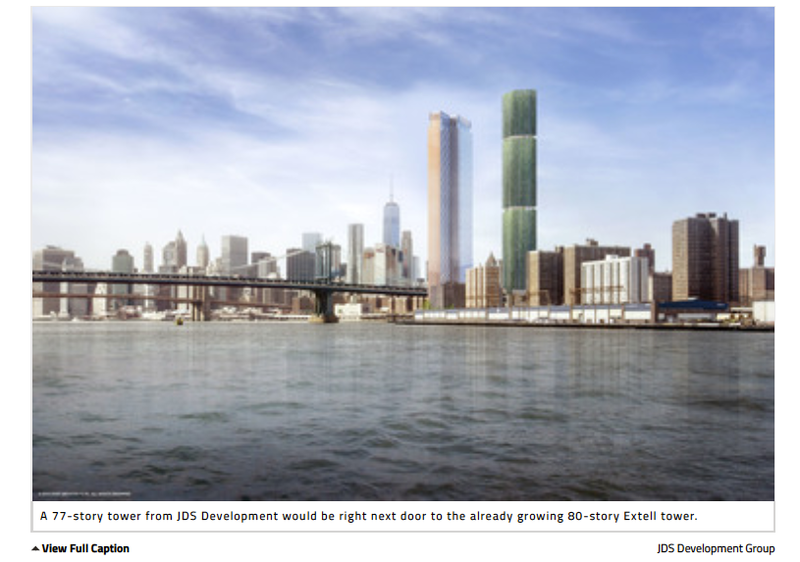 The construction of new 40-story skyscrapers will affect commercial areas and will ultimately wipe out the Chinatown neighborhood as it is now known: open-skied and beautiful. In fact, the argument to justify this operation has been that Chinatown is a messy neighborhood and smells bad. However, here the bad smell is the relations between the city councils and the promoters. Carl Weisbrod was employed by HR&A Advisors (a real sate and development firm) until 2014, when he was then hired by De Blasio as head of the Planning Department. In March 2017 he returned to work for HR&A. In the 1990s Weisbrod was in charge of the Times Square clean-up and he have been in charge of “cleansing” many other areas in New York. Who is deciding which populations get cleaned out? This week Chinatown. The following week HDFC shareholders. Who’s next?